[136 Pages Report] The Foam Insulation Market size was USD 17.58 Billion in 2016 and is projected to reach USD 22.39 Billion by 2021, at a CAGR of 4.95% from 2016 to 2021. In this study, 2015 has been considered as the base year, and 2016–2021 the forecast period to estimate the market size for foam insulation. Note: Core competencies of the companies are determined in terms of their key developments, and key strategies adopted by them to sustain their position in the market. 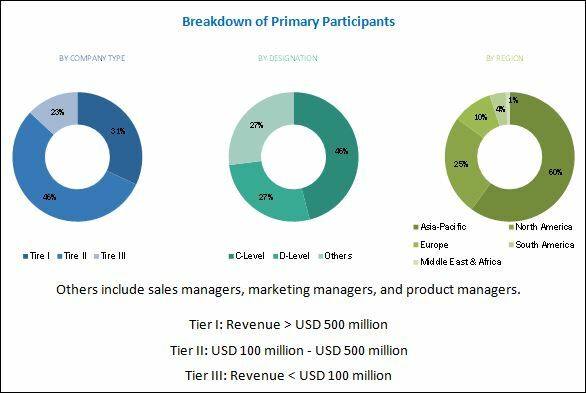 The key market players include BASF SE (Germany), Covestro AG (Germany), Huntsman International LLC (U.S.), Kingspan Group PLC (Republic of Ireland), Lapolla Industries, Inc. (U.S.), Owens Corning (U.S.), Recticel Group (Belgium), Saint-Gobain (France), the Dow Chemical Company (U.S.), Armacell International S.A. (Luxembourg), and Johns Manville (U.S.). This report categorizes the global foam insulation market based on product type, end-use industry, and region. The foam insulation market is projected to reach USD 22.39 Billion by 2021, at a CAGR of 4.95% from 2016 to 2021. The market is driven by the increased demand from end-use industries, such as building & construction, transportation, and consumer appliances. Focus on the reduction of greenhouse gas emissions and strict government regulations on the construction of energy efficient buildings are expected to drive the demand for foam insulation. The major restraining factor for the market is the lack of awareness about the benefits of foam insulation. By end-use industry, the building & construction segment dominated the foam insulation market in 2015. The foam insulation market is driven by the growing building & construction industry in the Middle East, as well as in Asia-Pacific countries, such as China, Japan, and India. However, the consumer appliances segment is expected to witness the highest growth rate between 2016 and 2021 due to the growing demand for appliances, such as freezers, refrigerators, and air conditioners, in various regions. The foam insulation market is segmented based on product type into polystyrene, polyurethane & polyisocyanurate, polyolefin, phenolic, and elastomeric. The polystyrene segment dominated the market in 2015, in terms of both value and volume, owing to the attributes of polystyrene foam, such as low thermal conductivity and lightweight. The polyolefin segment is projected to grow at the highest CAGR, in terms of volume, during the forecast period. The demand for polyolefin foam is due to its light and flexible nature, which is required in the HVAC (heating, ventilation and air conditioning) application. Several countries and regional organizations, including the U.S., China, South Korea, and the European Union, have various building codes for construction of new residential and commercial buildings. Asia-Pacific is the fastest growing market for foam insulation, both in terms of value and volume. 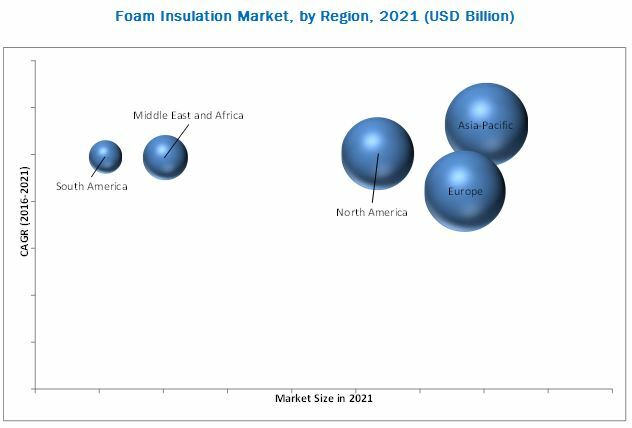 Population growth and rapid urbanization in key countries, such as China and India, accompanied by the rising demand for consumer appliances have contributed to the growth of the foam insulation market in this region. Increasing investments in the region’s building & construction industry also help drive the demand for foam insulation. Besides, major market players, such as Covestro AG (Germany), BASF SE (Germany), Saint-Gobain (France), and Huntsman Corporation (U.S.), are setting up manufacturing plants in the Asia-Pacific region due to the availability of cheap labor and low production cost. Companies focus on strengthening their position in the foam insulation market through expansions and new product launches. Major players active in the market include BASF SE (Germany), Covestro AG (Germany), Huntsman International LLC (U.S.), Kingspan Group PLC (Republic of Ireland), Lapolla Industries, Inc. (U.S.), Owens Corning (U.S.), Recticel Group (Belgium), Saint-Gobain (France), the Dow Chemical Company (U.S.), Armacell International S.A. (Luxembourg), and Johns Manville (U.S.).